When I made those simple pillows for Thanksgiving, I totally started something. Then I made some for Christmas and had fun making those. The other day I saw some pillows at the Bullseye Playground (that sure doesn't roll off the tongue easily like the one spot or the dollar spot, the old names for the Target dollar spot) and I snagged those suckers up. I know that starting with a pillow already made saves me time and sewing. They are also only $3 or $5 pillows, I don't remember how much they were this time. 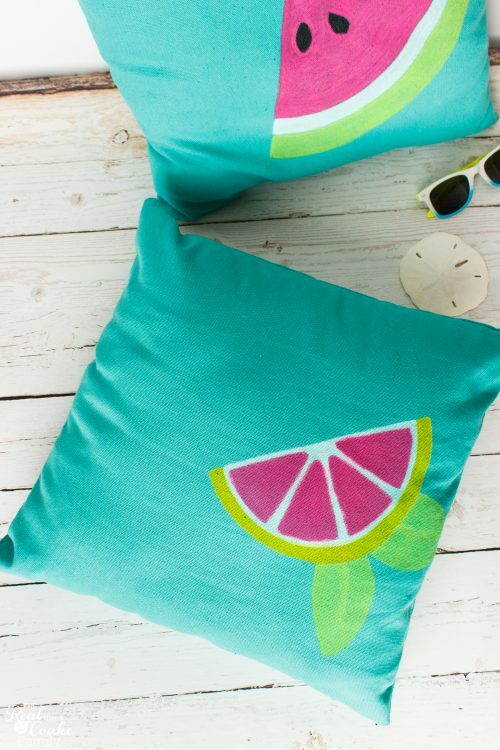 It makes it an inexpensive way to add some fun pillows. I also won't mind if next year I pull them out and I'm over them. Yep, that's how I roll sometimes…I get bored with these things easily and just donate them to my local charity. I've got a set of full-color step-by-step directions for you that you can download and print if you would like. That is at the bottom of this post. 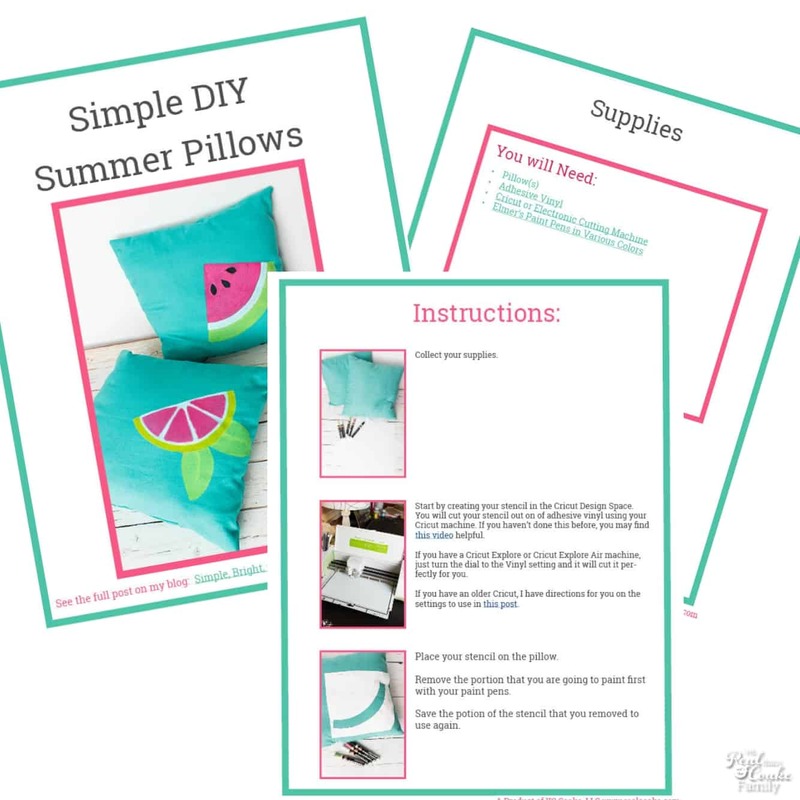 The formula for these pillows is very similar to the pillows I did at Thanksgiving and Christmas. Cut out your stencil and paint, I prefer to think of it as adult coloring, your pillows with the Painter's pens (affiliate link). 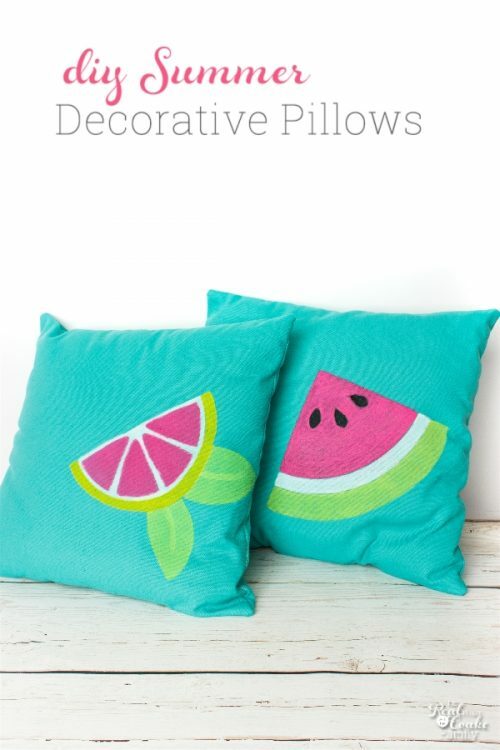 These pillows were a bit different because it wasn't one simple pattern that needed to be painted or colored in. I devised a way to still use my stencil and get them done. I've got the full step-by-step in the directions at the bottom, but as you can see if you compare this picture with the last, I painted one section and replaced the stencil for that portion. Then I removed the next section and painted it and replaced it. I kept going like that until the pillow was complete. 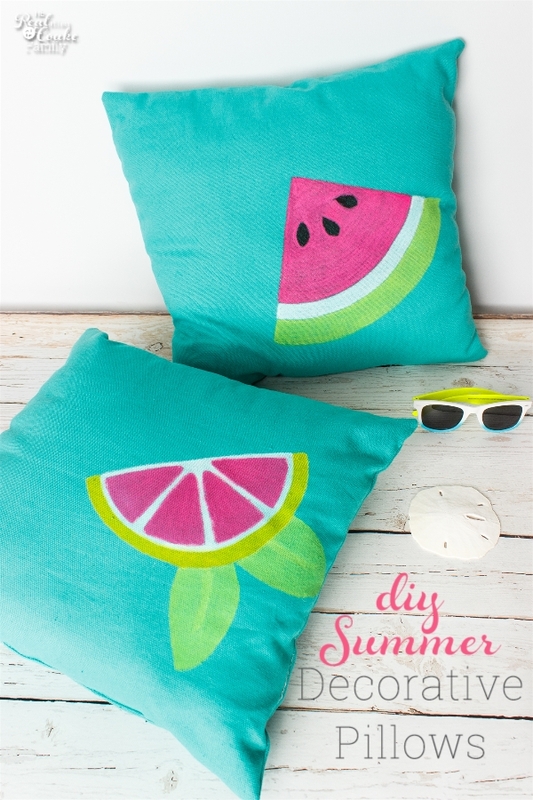 I initially painted the watermelon pillow with a different color pink, but when I discovered I had this brighter pink, I did a 2nd coat to brighten things up. The lemon pillow, I decided to use non-traditional lemon colors just for fun. For both pillows, once I removed the stencil, I went over everything with a 2nd coat. It really made a difference in terms of the brightness of the colors. Fun! I'm so super happy with how these pillows turned out. I was inspired to make them after I saw these adorable watermelon coasters that Young at Heart Mommy made. I'm loving all the fun fruit stuff I've seen trending this year. Fun and Happy colors! Get your step-by-step directions below. 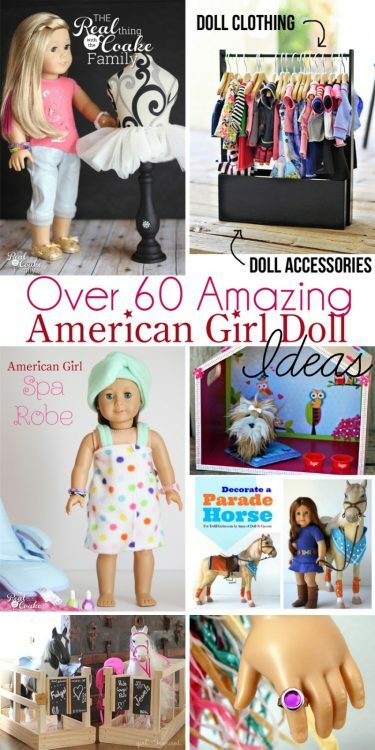 Follow me on Facebook or Instagram for even more fun crafty ideas and inspiration. 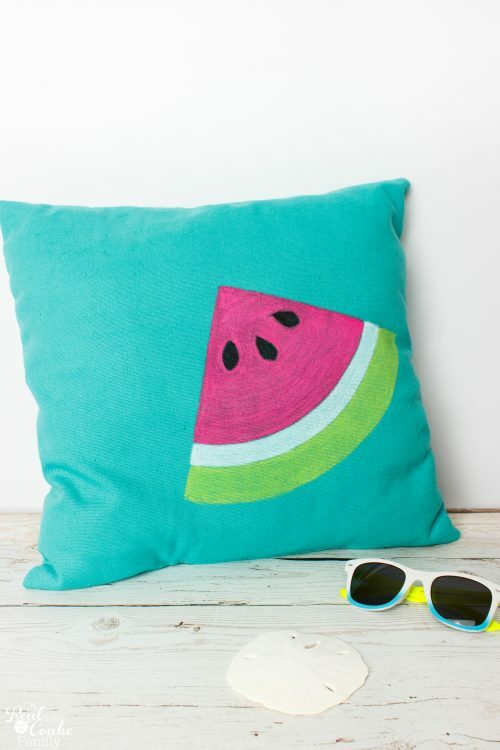 Have you made fun decorative pillows? What did you make? Leave me a comment below. 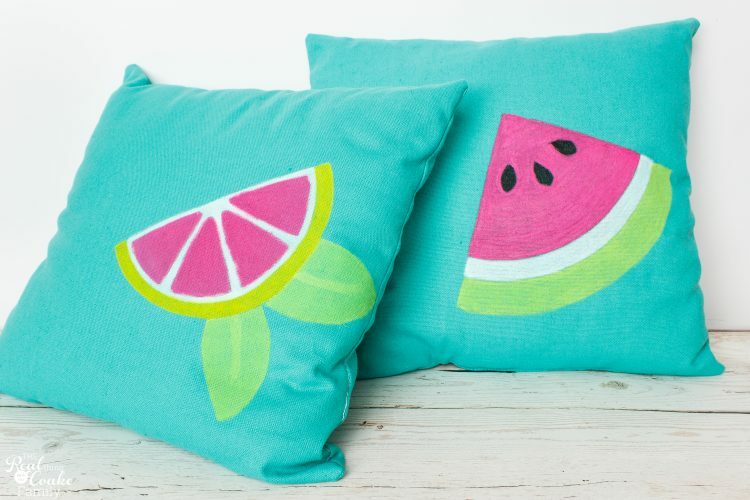 Super cute pillows! They would love awesome on my front porch swing! I love that you used markers to make them. Thanks! They would be super cute in a porch swing! 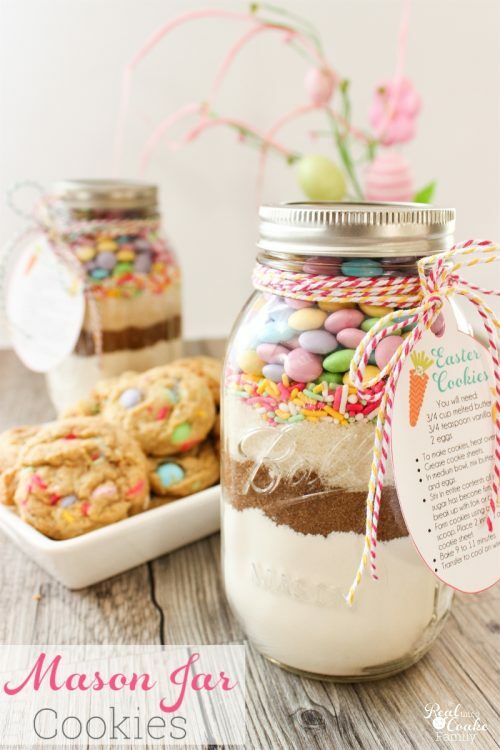 I feel like that just screams summer and the need to sit out there and eat ice cream. 🙂 The paint pens make this project so easy, almost more like coloring. Fun! 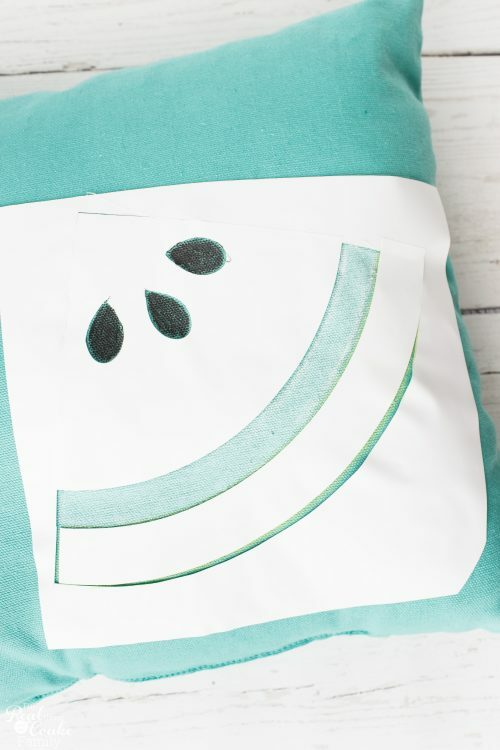 Your pillows are adorable – pinning to share. These are so cute! I need to make some for my outdoor space. Pinned! They are so bright and cheerful, love them. This project looks like so much fun! It came out so cute too. Thanks for joining the Family Joy Link Party! I love these! I definitely want to make some of these for our outdoor couch and chair. This would be the perfect pop of color I’ve been wanting. Thanks! Super fun! 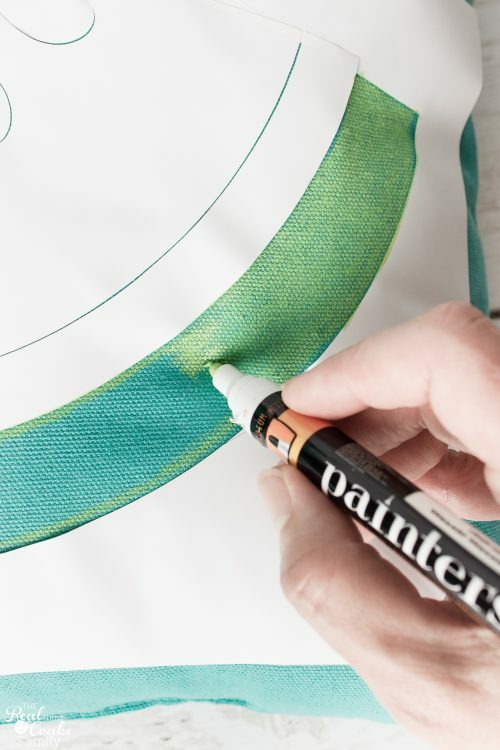 We have a whole bag of fabric markers so this is a good idea on how to use them. Visiting from Dream to Reality party. How cute! I thought they were appliques at first!! Thanks for sharing with us at Throwback Thursday! Thanks! Yes, I painted it. There are full downloadable step-by-step directions at the bottom of the post if you need/want them. Thanks so much! They would add fun and color year round for sure. Enjoy!